Community Partnership and is managed by a team of volunteers. Morning tea, coffee and home baked treats are provided by the catering team of St Mary’s Parish Church in the church hall. On the first Thursday of every month with the exception of January, the market is held in the car park of St Mary’s Parish Church beside the Square in Comber. 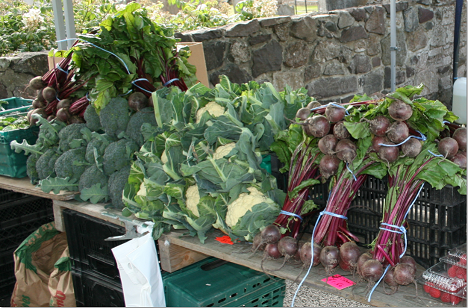 Local food producers, growers and bakers sell their produce at market value prices to a wide range of customers. Usually there are 25 stands with everything from fudge to fadge. The market has been so successful that there is a waiting list to book stalls. This is an artisan food market (there are no crafts or fast food) selling the highest quality local, fresh, seasonal produce made by people who are passionate about producing food for people who are passionate about cooking and eating food! Opening times is 9.00am -1.00pm.